There is often confusion when ordering boxes on the way to measure for them. Many times people have the box faced in the wrong direction when measuring, then the boxes are delivered the size is completely different from what they measured for. Another common mistake is mixing up the numbers when reading the box size. A 14x14x4 box is a completely different size than a 4x14x14 box. We would like to take the time to point out how we measure for boxes at U.S. Packaging & Wrapping to help ensure people they are ordering the correct box size. To make things more simple we will only talk about three box types and give illustrations on the measurements. There are tens of thousands of box sizes so this is a good starting point. The three boxes we will be going over are: square boxes, flat boxes, and tall boxes. All of our boxes are measured by Length x Width x Depth/Height. 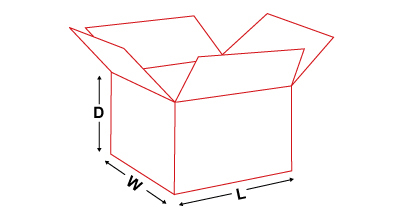 Depending on how the box is laying, those length can be mistaken which will completely throw off the box size you may be after. Let’s start with the easiest box type, square boxes. Square boxes are fairly easy to measure for. The flaps should be facing up and the opposite side of the box flaps should be on the floor. Check out the illustration below for reference. As you can see, the box flaps are facing up and the opposite box flaps are on the floor. Pretty easy and self-explanatory for the square boxes on finding the right box size. Not to bad on figuring out which way is the length, width, and the depth. I believe this illustration was based upon a 9x9x4 box. Which is 9 inches Long, 9 inches wide, and 4 inches deep. The next illustration is by far the most commonly mistaken type of box that often results in ordering the wrong box size. The tall box, not to be confused with the long box. People ordering this box often mistakenly think the depth is the length. 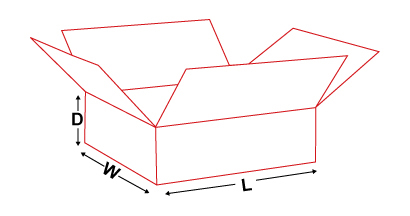 This illustration was based on a 4x4x15 box, which is totally different from a 15x4x4 box. It is one of the most common mistakes people make when figuring a box size. When measuring for the proper box size, remember to face the box flap straight up and remember that boxes are measured by Length x Width x Depth/Height and that will help to keep you from ordering the wrong box size. Please feel free to browse our wide selection of boxes. If you need a size that you do not see online, call us at 1-800-441-5090. We carry thousands of box sizes. 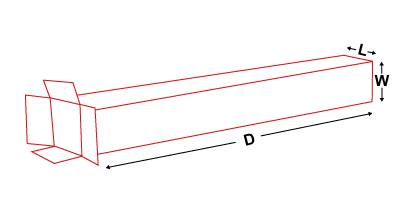 The bottle not regular shape ،how can I measure the dimension of this bottle . The best way to measure would be placing the 4 bottles together the way you would like them arranged. Once arranged how you would like them, measure the Length, Width, and depth of the products to determine the box size you need. You will want to be sure to get larger boxes than the products measure out and use void fill for gaps.